Rich Birdsey of the U.S. Forest Service, Northern Research Station, provides a presentation on forest management options for carbon sequestration with a particular interest in considerations for the eastern United States. 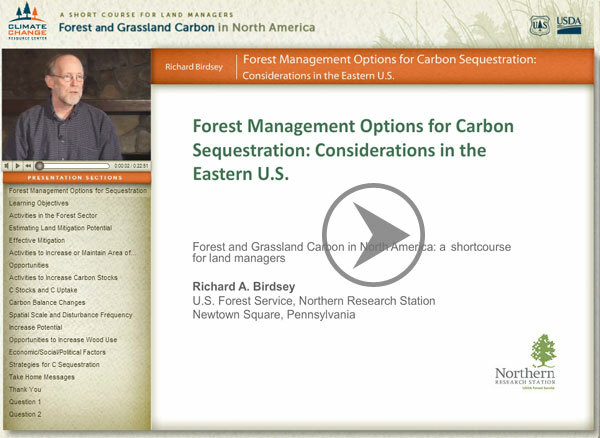 This presentation offers information on different forest management options and their potential impacts on carbon sequestration. It looks at the effects of the spatial and temporal scale on ecosystem carbon and how these affect choices faced by land managers. It discusses barriers to implementing forest carbon management and provides examples to illustrate how carbon management has been approached in the Eastern U.S.